Rides leave the store on the half hour, starting at 9am Friday and Saturday. 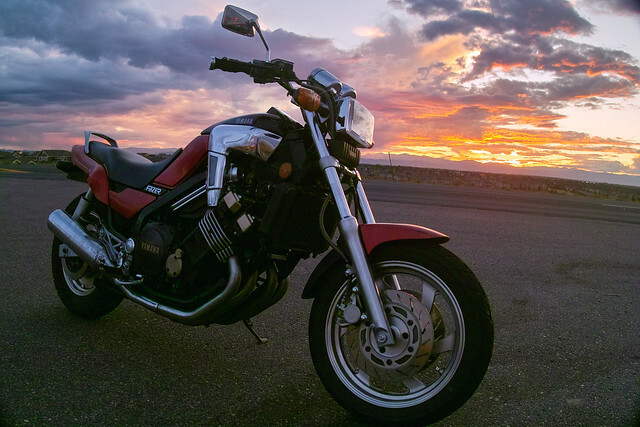 Bring your Colorado Driver’s License with Motorcycle endorsement, and wear a helmet and appropriate clothing for the ride. Riders must be over 21 years old. Make sure to come to Vickery and take advantage of the opportunity to test all the great Star Cruisers! Everyone get down to G-Force powersports tomorrow!!! The Yamaha Demo truck is here with all the new 2012 motorcycles to ride. 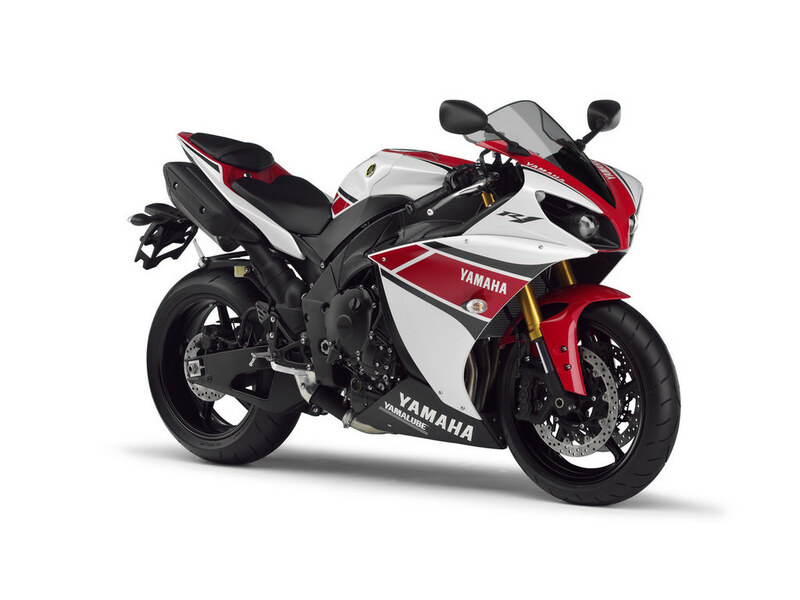 The First 10 people to buy a new yamaha will get $200 off. Prizes given out all day! Special discounts to buying riders !! Yamaha R1 from Serge Moskalets on Vimeo. 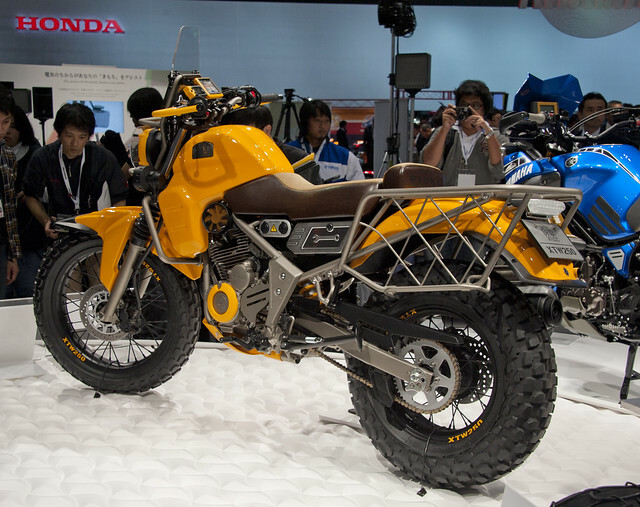 At the 2011 Tokyo Motor Show, Yamaha presented their newest concept, the XTW250 Ryoku. The Ryoku means strength or power in English. It’s got a large fuel tank, and the belly pan protector can be removed and used as a shovel. 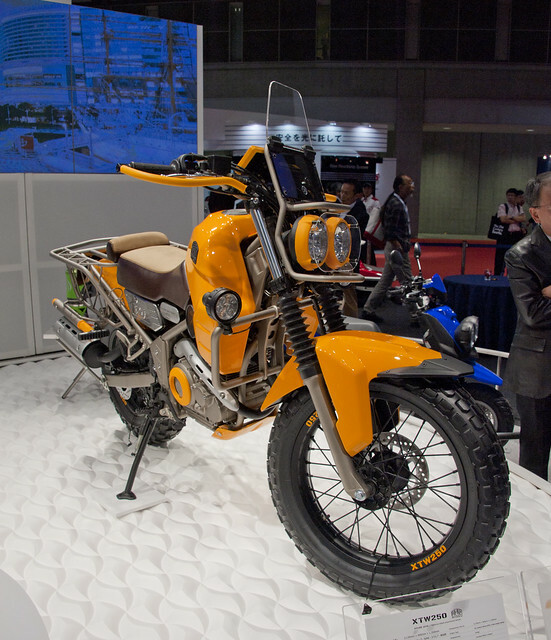 Looks kinda Tonkaesque, but I like the TW200. I wonder if it will come to market. This article courtesy of the Naval Safety Center Smart Ride 2011 Magazine. Please also check out their website, the Naval Safety Center. In March I attended the two-day Yamaha Champions Riding School (YCRS) at Las Vegas Motor Speedway. This course is led by Nick Ienatch, who formerly instructed at Freddie Spencer’s riding school and assisted the Navy, Marine Corps and Motorcycle Safety Foundation in creating the Military Sportbike Rider Course. Nick is a highly renowned sport riding expert and is the author of Sport Riding Techniques. I knew this was going to be some good training. My purpose for attending was to improve my skills and become a better, safer, and faster rider. Whether you’re an avid rider, occasional track day guy, or just a weekend warrior, I believe every rider will get something valuable from this type of training. More than that, I think everyone should attend a course like this. If you were a golfer and wanted to improve your swing, wouldn’t you seek out a local professional for help? This is exactly what I did for my motorcycle riding skills and I am glad I did. Money well spent. YCRS is kept to small numbers of 10 to 12 students. This keeps instructor-to-student ratios very low, allowing for plenty of one-on-one time and feedback from instructors. There was a mixed level of experience, including a first time track rider, repeat students, amateur racers, the owner of Silver Star Clothing Company, and even ESPN X-games BMX Gold Medalist Chad Kagy. At the course, students ride the latest Yamaha R6 and R6Rs and groups are separated based on experience level. Since I had a handful of track days under my belt, I fell into the medium-to-faster paced group. I was comfortable with this pace and on occasion, I had to push to keep up with the faster riders of the group and the instructor’s pace. We started in the classroom with introductions and then got right to business. We covered braking, reading the circuit and types of corners, levels of risk, non-negotiables (more on that in a sec) and more braking. By the way, if you don’t get a bite to eat at the hotel, YCRS will have a spread laid out for you, with food and drinks and a hot lunch. If you don’t have your own leathers and gear you can rent the latest Alpinestars gear from the school. This is especially helpful if you are flying into Las Vegas and want to save some space and weight in the luggage. After the classroom brief, students and Nick packed into the passenger van for a few laps on the Las Vegas Infield Circuit. Nick spent plenty time explaining each corner in detail: early apex, late apex, entry, exit and getting the motorcycle pointed for what is next. “Non-negotiables” were discussed as well. What are they, you ask? These are the basics that form your riding foundation: items that do not change and things you must or must not do. One example is being smooth on the controls. You cannot be jerky in your use of controls; this is non-negotiable. With each lap in the van, the driver increased the speed of the over-loaded passenger van and demonstrated the braking and line that is required. It’s important to know the circuit. We exited the van at one of the last corners of the circuit, while one of Nick’s instructors rode a few easy laps on his Yamaha to warm his tires. Nick took the opportunity to give us a lesson on braking. Were you taught never to use the brakes while cornering? I was, and this was all about to change. He also taught us about trail braking. YCRS motorcycles’ brake lights are kept functional to show you how far it is possible to brake in corners (trail braking). Students were standing just off the track while instructors were cornering a few feet in front of us—giving the lesson of a lifetime in trail braking. Many drills were conducted based on trail braking and other braking techniques and we learned a ton about improving one of the motorcycle’s most critical—if not the most critical—controls. Brakes are a multi-positional control, and not just an on or off switch. When used correctly, you are not only able to adjust your speed, but you also have the ability to change the motorcycle’s geometry and create a better-steering bike. For example, does your front end dip when you apply front brakes? This changes the geometry of your motorcycle to a more easily turning machine. When coming to a stop, does your front end dip dramatically and then rebound back? If so, you aren’t controlling your brakes well. You should have some front end dipping of course, but it should return smoothly. This is practiced each time you bring your motorcycle to a stop. We put all this and more to the test with day-one drills. A fantastic drill that we worked on was called the “pointy end of the cone.” In several corners of the circuit, instructors placed a traffic cone on its side. We had to adjust our motorcycle in mid-corner, including steering, braking, and lean angle, to negotiate to the pointy side of the cone and then exit the corner to the next challenge. The key to this drill is looking well ahead in the corner. What makes this drill so effective is that the instructors were standing off-track observing our skills, and moving the cone each lap. We never got the same scenario twice, which forced us to constantly adjust to each corner. To brake and clutch with four fingers or two? That is the question. Many of us are taught to brake and clutch with four, but all you really need is two. You have far better control and feeling when using two fingers on the brakes, with the other two still in control of the throttle. When clutching, you really only need a small amount of lever pull to unload the engine to up-shift. On the down-shift the two fingers provide added control on the left bar and again more precise control than four fingers. This is something that definitely takes some getting used to and a lot of practice. Body positioning, and hanging off the bike is also covered. This is where the mantra “Look GP to Ride GP” comes in. 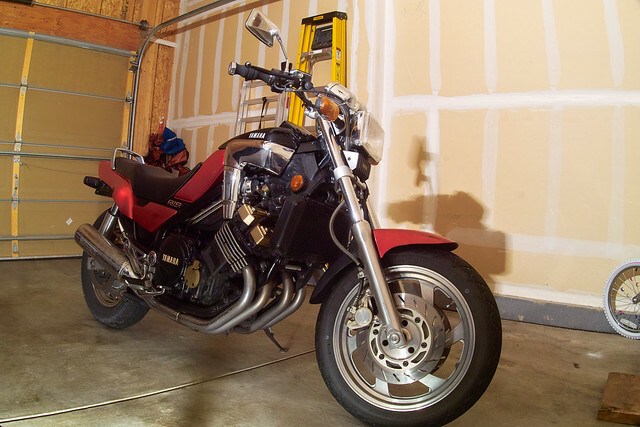 Hanging off the bike decreases the motorcycle’s lean angle in a corner. This is necessary to increase your lap times on a track and proven by the pros to work. 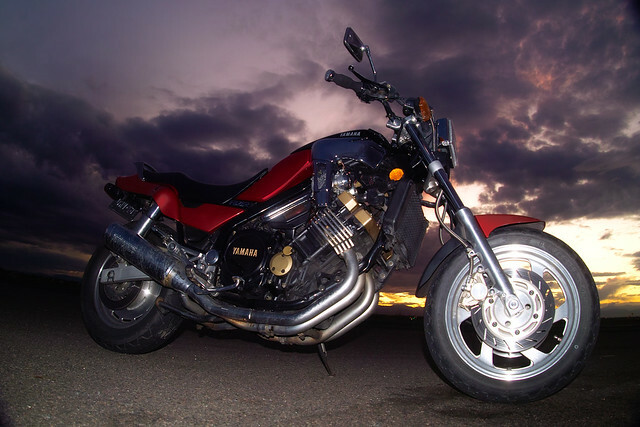 However, motorcycle lean angle also decreases grip and increases your risk. You want to decrease your risk, yet remain fast. Many riders may get their lower body off the bike or their knee down, and increased lean angle and may not even be necessary. This is increasing the risk! Learning and practicing correct body position will definitely decrease your risk and increase your fun. Ever two-up ride with an instructor? This is an amazing learning tool. During most of the day, I struggled with heavy braking, as do many riders, learning how hard I can actually brake. Riding with instructor Ken Hill for a lap as a passenger made me realize the bike can brake much harder than I had ever realized. It felt like I was on the edge of going over the front, yet in full control of the motorcycle. We moved from the infield course to the Las Vegas Classic Course that is outside the oval. Again we spent a few laps in the van with Nick to learn the new course. Using what Nick taught us in day one, this was easily accomplished. Then we were on the bikes to take a few sighting laps and warm our tires. We spent the first day concentrating on the use of our front brakes. Day two we practiced a drill of using only the rear brakes for a few laps and it can be done—not as fast but it can be done—again concentrating on controlling the brakes. Ever take your left hand off the steering wheel while cornering? Not on the streets I hope. I have only seen this done by the pros and now the instructors showed us how it’s done and told us we were going to do it ourselves. My first thought was “no way.” However, it wasn’t done to look cool, but to teach us control. Once the motorcycle is pointed and turned in the corner, and as long as you maintain a consistent throttle, you can do this. At first I barely let go of the left grip. After a few laps practicing this skill, I was pointing to the apex cones like the instructors and smiling from ear to ear in my helmet. Next we got to follow the instructors around the course, but they were not taking the racing lines. They would ride erratically, braking and turning in early, running wide in corners, and many other scenarios to see if we would follow them or keep the correct lines. This was a highly effective drill for concentrating on the correct lines. It’s excellent for street riders, teaching them not to get sucked into mistakes that other riders make in front of them. After that, we got off the bike for a lesson in one of the corners. We watched Ken Hill demonstrate incorrect braking and cornering and were asked to identify the problem. Late braking, early braking, running wide, abrupt throttle control—many different scenarios were demonstrated. Now, what to do to correct them? As a group we discussed what we learned and how to apply the skills to correct these problems. These up close and personal demonstrations made the learning far more effective. My favorite drill of Day two was a braking competition. Students lined their motorcycles at the top of a small hill. While in neutral, we coasted the bike until we reached a braking marker and there we applied the brakes. Whoever can keep the brake light on and coast the furthest wins! This teaches you the fine art of braking, how little you can apply your brakes and what a useful tool your brakes can be. Right now, you may be thinking to yourself, “I am not a track day rider and this training pertains to the track.” I disagree. Where are the majority of crashes on the street? In corners right? What if you could train yourself to adjust mid-corner effectively and safely? This is a huge benefit to any motorcycle rider. To accurately control braking and use this as tool to adjust speed and bike geometry, makes the motorcycle turn more effectively and gives any rider an advantage on the track or the street. If you think the latest exhaust or a new ECU is going to make you a faster or better rider, try spending the money on the best training instead. For the cost of the latest upgrades that will only last a few a years, you can invest in training and knowledge from the Yamaha School or other reputable course. For any rider, this knowledge is an investment in skills for a lifetime of riding safely and improvement. I like these little Yamaha TW200s. Fairly inexpensive, and fun in the dirt. Isaiah Kool receives his motorbike! from David Altizer on Vimeo. Isaiah Kool is an incredible disciple of God. He is a pastor in Ewaso in the Rift Valley. He would walk miles and miles to go to other churches and would walk hours and hours to get to where he needs to go to serve the Lord. Don and Michelle, with the help of supporters, were able to purchase this motorbike for Isaiah to use. He was so shocked and so thankful for this blessing. The bike is a Yamaha DT125. Motorcycle.com lets it rip on 4 streetfighters, the BMW F800R, Aprilia Shiver, Triumph Street Triple R, and the Yamaha FZ8. The Ducati Monster 796 was late to the party, and was prevented from joining. I like how they call them unfaired funsters, check out the comparison.